I am pleased to report that I am pretty much over my bout with pneumonia except for a lingering cough. I haven't been out and about as I normally would this past week due to the wet and cold. Just didn't think it wise and my Dr. encouraged me to take care of myself and I've tried to do just that. I've missed my morning walks on my treadmill too and will be back with that come Monday morning. I can't say that walking on the treadmill is all that much fun but when I'm not able to do it, I find that I really miss it. And, I always listen to some great sermon or Bible Study on my Ipod while I walk and I've sure missed that daily inspiration. Once Christmas is over my thoughts immediately turn to Valentines. 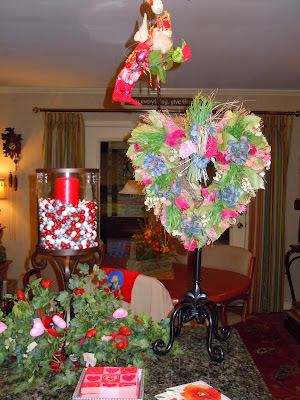 I have always loved Valentine's Day and do just a little bit of Valentine decorating on our kitchen island and the dining room table. 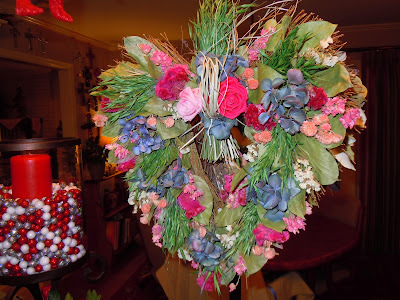 I always enjoy using my Mark Roberts fairies to decorate and then I found this pretty dried heart wreath at Williams Sonoma . 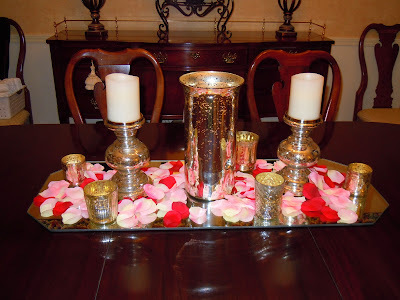 I recently saw some Mercury Glass pieces in one of the many catalogs I get and immediately thought how nice some pieces would look on my mirrored runner on our dining table. I am pleased and it looks even better when the candles are lite. I remember Mercury Glass from when I was a child and I cannot believe the big " comeback" that it is making today. I'm sure some of you young gals had never even heard of Mercury Glass before it's popularity in the past year or two. How funny! Speaking of when I was a child..............one of my most fond memories of Valentine's Day was making my box for our exchange of Valentine cards at school. I never won the award for the prettiest box, but I had more fun creating it and getting my Valentine's all signed and ready to exchange. I don't know if school age kids even do such things today, but I hope they do. I want my Grans to have the experience one day. It's always such fun to link up with the Company Girls on Friday. 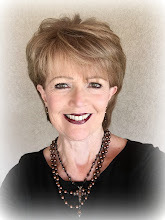 Rachel is such a faithful hostess and we so appreciate her and her inspiration in our lives. Click on the button above to enjoy more Company Girl Coffee. We are all born with the need to be loved and never outgrow it. I had no idea that it was called mercury glass, but I love it! I don't have any, but now, I think I must start with a few beautiful pieces! I love the wreath! I don't really decorate for Valentines Day but I did just order some treats for my girls and my hubs to be delivered on the day. I sent fun popcorn tubs to my girls and ordered some Omaha steaks for my hubs...he grills out no matter the weather and loves steak so its a good gift for him. Oh, your decorations are always so pretty! Maybe someday I will go past just being inspired and actually do a little! Glad you are feeling better. I am READY for sunshine, too. The snow was fun once, now it can go away! Glad you are feeling better! Take care of yourself and let your body heal completely! Hope to be t here in a couple of weeks! I love all the Valentine's decorations. There's nothing like hearts and love. So glad that we know the True Love though. Btw, you need to come to Phoenix. I hate to say this but it's been sunny and in the low 70's all week. But pretty soon, we'll be complaining that it's too hot. LOL. Have a great day and so glad you're feeling better. I'm SO, SO glad that you're feeling better. Hope you can avoid the wintry mix (we've got another 3-6" forecast for Sunday-Monday ... on top of the 12" we got yesterday ... oh my!). So glad you're doing better, Lea! Thanks for sharing your pretty Valentine's decorations. I love the wreath! Valentine's Day is very fun around here with 5 children. 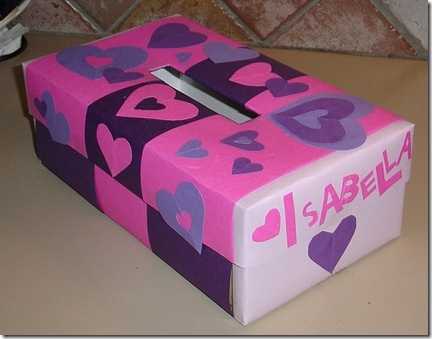 Last year we made special Valentines boxes. I will probably do it again this year with the kids, it was so much fun! Oh what fun decorations! I love, love, love Valentine's Day! I wish we lived closer....I'd ask you to come over and help me decorate! You've inspired me today! Love it! Glad you are feeling better and hope the sun comes out where you are. The past few days here where I live have been cloudy & overcast but not too cold--my absolute favorite;-) the only thing that'd make it better would be a good thunderstorm but they don't have those too much here in NO California. 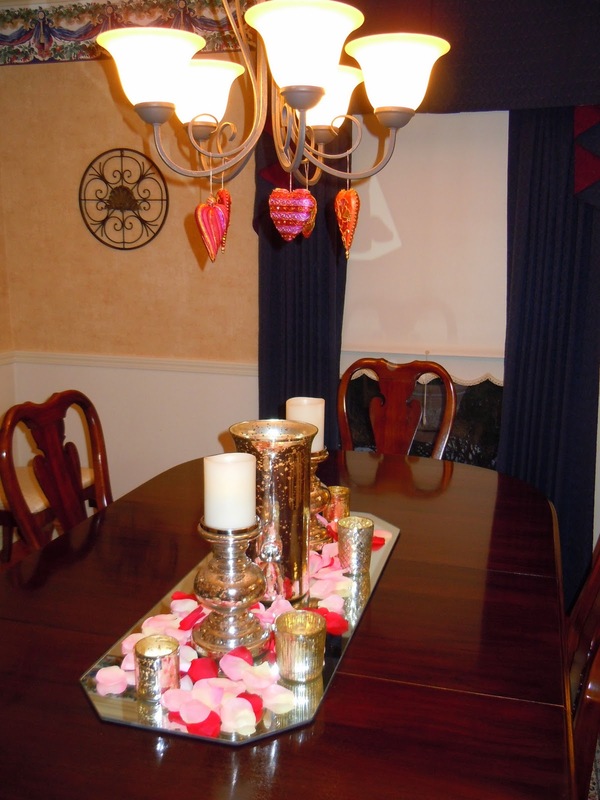 Valentine's Day is my favorite holiday, but believe it or not I've never decorated. You've inspired me though. I'm going to have to see what I can come up with! Glad to hear that you are feeling better. I love your decorations for Valentines' Day and the mail box for Valentines. That reminds that I need to put up the few things that I have for that, too. I especially like the candles in your pictures. Your wreath is just lovely! I wish I could send you some sunshine - we had a brilliant dose of it today, but to be honest, that's pretty rare here in OH! It came with frigid temps though, so I felt quite at home - a wee taste of my Canadian winters! What beautiful Valentine's displays! So glad you are feeling better, and I know what you mean about the sun, I have looked at those light boxes as well! I just seem to do better when the sun shines!